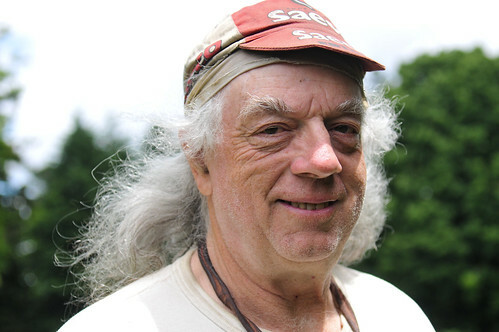 Southeast Portland resident Brian Willson is a prominent anti-war activist and veteran of the Vietnam War. 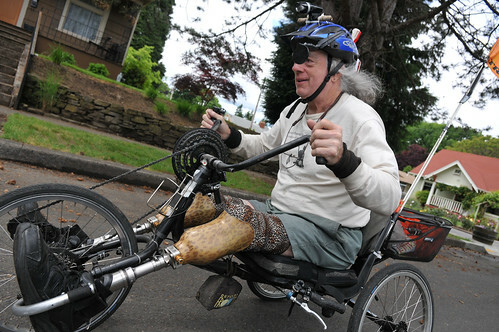 Tomorrow morning, he’ll embark on an 1,100 mile handcycle journey that will take him through Oregon and California. Willson, who will turn 70 on July 4th, is promoting his new book, Blood on the Tracks: The Life and Times of S. Brian Willson (PM Press, 2011), and plans to ride to book signings and speaking gigs. I met Willson a few weeks ago at Woodstock Park to learn more about his life and how handcycling has helped him gain perspective and keep his sanity in a confusing world. After becoming “radicalized” while serving as a commander in the Vietnam War in the late 1960s, Willson got heavily involved in the anti-war movement and has spent his life speaking out against U.S. foreign policy. During a demonstration in California in 1987, he was intentionally run over by a US Navy munitions train en route to Nicaragua. Willson told me he expected the train to stop and that he’d be arrested, like had happened before. I made the mistake of calling the incident an “accident” during our chat. “It wasn’t an accident,” he interjected, “It was assault. 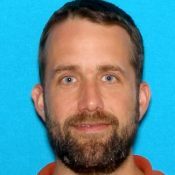 It was attempted murder.” The collision resulted in a fractured skull and the loss of both of his legs below the knee. 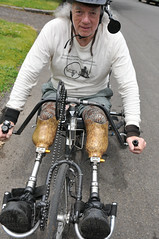 Brian rides a Varna handcycle. 10 years later he discovered handcycling. “It was like, aaaaahhh liberation,” is how Willson described his first rides. Now he rides about 100 miles a week and credits it with saving his life. His book isn’t about cycling at all, but cycling is definitely part of who Brian Willson is. 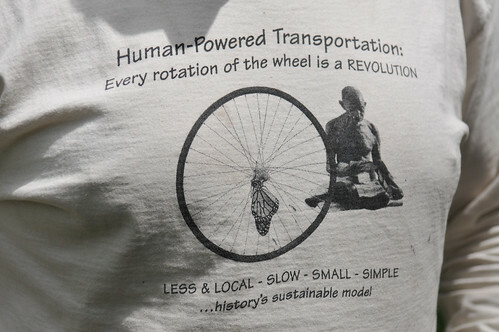 Cycling at about 10 mph, Willson’s preferred speed, allows him to interact with other people and the natural world around him at what he calls a “human-scale” speed. 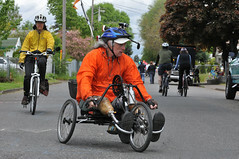 Brian at Sunday Parkways in May. 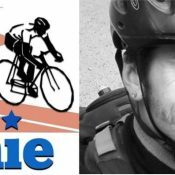 On his 1,100 mile journey, Willson will ride with his friend Joel Finkelstein. The two have been training together and prepping for months. Finkelstein tells me it’s been “an honor” to get to know Willson and he’s looking forward to the adventure. You can meet Willson tonight for the official book launch party at People’s Food Co-op (3029 SE 21st Ave) at 7:00 pm. Brian and Joel would also love some company for the kickoff of their tour this Saturday at PSU. 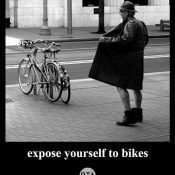 Meet at the South Park Blocks behind Lincoln Hall (between SW Mill and Market) at 8:00 am and join them for part of their ride down to Newberg where Brian is due at a book signing by 2:00 pm. — View more photos of Willson in the gallery. — Read reviews of Willson’s book, including praise from Noam Chomsky, Daniel Ellsberg (he wrote the intro), and others at the publisher’s website. — Learn more about Brian Willson on Wikipedia and stay updated on the tour via Bloodonthetracks.info. What an amazing human being. If all goes as planned, I hope to be in good enough shape to do a ride similar to his in the next few years. Where can I purchase those shirts for a few dozen of my friends? P.S. Jonathan, I think you forgot to close an italics tag in the story. Everything’s coming out slanted down here. Awesome. Brian, did I ride with you on pedalpalooza WTF Bike Noir? Also, I believe I heard you speak at 1st Unitarian downtown a while back. Anyway, I applaud your efforts to get the message out, both about war & about human scale. It’s all interconnected like a web. The turning point for me was when I was but a kid, I heard that OUR govt shot dead four of OUR college students at Kent State. Whoa. Light bulbs lit up in my head. Looking forward to talking with you sometime. Hope to see you on the road around town when you get back. Thanks Jonathon for a great article about Brian Willson. 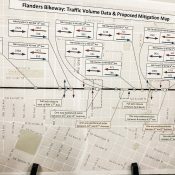 It was standing room only Friday night at Brian’s book reading.One of the many things Brian said was that if a “decrepit old man” like him can cycle down to San Francisco from Portland, any of us can use cycles as our main mode of transportation. I cannot wait to hear what happened Saturday morning. I filmed the Friday evening event of Brian speaking and will post it here on this thread within the next 24 hours. In Solidarity! I haven’t ever meet Brian Willson, but he seems like I person I would love to talk to. I will be cycling down to San Fransisco, CA heading south from the coast on July 4th. Hopefully we will meet up on the road. Safe journeys Brian Willson!